Single serving: breakfast sandwich at Oda Restaurant and Brewery???? Sure, we all lead busy lives and don’t have time for many things we should be doing and at least, think we should be doing. But breakfast is the most important meal of the day (so they used to tell us as the ruling on that is still up for debate) and it is always good to get out there and have a little, or big, something to really get us going to face the challenges of what will probably be a totally s**t day! 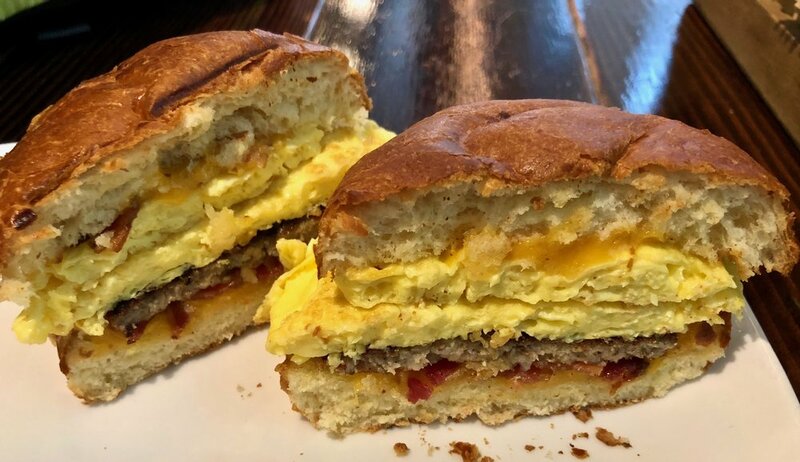 Okay, maybe I’m projecting a bit, but I do love a good breakfast sandwich as I have shown over the years and I will definitely go a little bit out of my way to work on occasion to try one. This is what lead me a few blocks over from my usual walking routes to Dogpatch and to a place in Mission Bay you probably wouldn’t even know about unless you work at Kaiser or UCSF’s hospital there. It’s called Oda Restaurant & Brewery and I only came across on a run through the area recently. I think the name initially threw me a bit, particularly the brewery part, but turns out, they do have a house brewed beer which I probably won’t be trying at breakfast time. (If I’m gonna drink that early, it’ll be wine, thank you very much since it is kind grape juice) It is only open Monday through Friday to feed the local workers it seems and they open early enough to offer a few breakfast things including a sandwich I felt I needed to try because the basic version starts at only $5! Yikes, could this be a rare SF bargain? I had to find out. 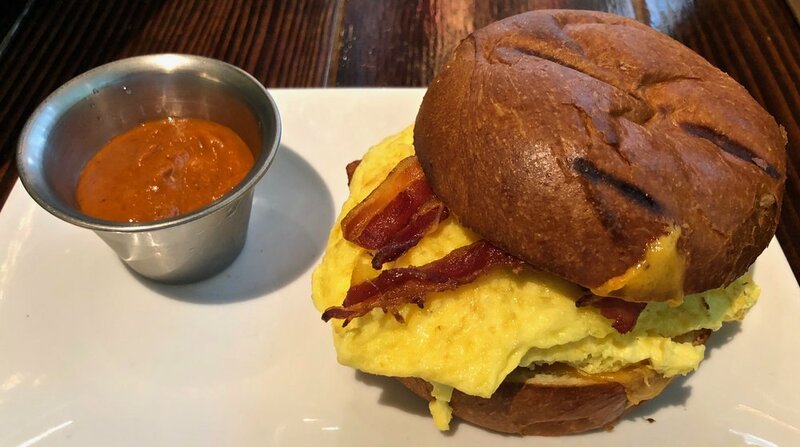 They call it the breakfast sando and the basic is egg your way with choice of cheese on a toasted brioche bun and a side of Oda sauce for $5. In and of itself, yep, that is a price deal. You can add a meat of your choice for an additional $2, which would bring it to $7 and kind of still a sandwich bargain. Maybe I was a little heady or maybe I just hadn’t had enough caffeine at 9am when I was there but I went a little all in and decided to not only add bacon to my sandwich but splurge and get sausage too. That is right, I was double meaning for breakfast! In breakfast sandwich terms it is a decent sized one compared to some you might get which are only a few blocks away. You do get two eggs that were nicely scrambled and folded and fill it up. I went for the cheddar cheese as it does add nice little sharpness with the egg. As you can see from the cross cut there was bacon on top and more bacon on the bottom along with a sausage patty. And here is where I am torn as to the meats. You all know I love me some bacon, but these days I am starting to enjoy sausage more. Yes, they are both from a pig, but sausage comes across as juicier and more flavorful with all the sagey-ness of it. And when you put both on a sandwich like this, the sausage comes out a little better. I don’t know, maybe if the bacon where thicker and smokier they would compete a little more evenly, but that isn’t usually gonna happen unless they super pile it on. Now this comes with something they called Oda sauce. I asked what it was and they said it was a special house made sauce without much other detail and being the dubious person I am, I asked for it on the side. Turns out that was a good idea for me at least. The sauce seems to be some kind of thick tomato based mixture with a lot of different spices that come off a little harsh to my taste buds. It tasted almost Italian like with oregano and basil and stuff, but when I put some on the sandwich to try it all together, all I could taste was that sauce, and it wasn’t too pleasant. This I will chalk up to personal taste and mine personally, did not like it. Which leads me to tell you the brioche bun, while nicely toasted, was not buttered! It seems like such a simple thing to do to elevate a sandwich, but alas, it doesn’t seem to happen. Fortunately I asked for a small side and was able to spread it across the top and bottom to really make this shine. In essence, while you don’t really need two meats on here, I did like the sandwich and for $5 or $7 ($9 is a bit extreme and would not do again), I’d say this is a breakfast sandwich bargain in SF. And will I wouldn’t necessarily walk like a mile out of my way for it, the two or three blocks I went was still worth it if I needed a little morning pick me up. It also works if you find you have to go to Kaiser and you need some nourishment while you pick up a script. Gotta have something to wash those meds down with!